Students presented their business model to a panel of local business representatives and entrepreneurs. Tech Valley Seniors recently completed their annual Capstone – a project designed to encompass all their classes in one large project. The project focused on creating a business model using the Value-Proposition Canvas and the Business Model Canvas. The Value-Proposition Canvas addresses the fundamental pieces of any business – what business issues need to be solved, how to solve it with a product or service, and will a customer pay for the solution, while the Business Model Canvas helps determine where revenue comes from, what the costs are, how the company connects with its customers, along with other logistical concerns. Decisions must be made using good business reasoning, something that an average business person would call realistic using “reasonable business logic”. Morrill says using these canvas’ makes the project truly authentic. Each project also had to contain a nanotechnology component, including a small proof of concept of their technology as it relates to their new product or business. Students conducted practical customer surveys in math (statistics), created infographics in art, and developed their presentations in ELA. The project in all took about six weeks from start to finish. Developing the models was only the first part of the project. Once the model was complete, student teams presented their business model to a group of business leaders. 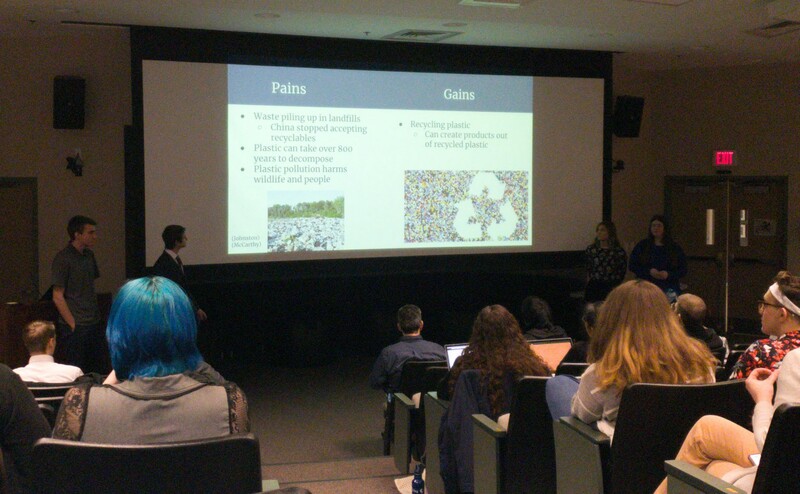 “I would have to say that the project presentations exceeded my expectations. The idea generation was quite good. When you see competitions now, you often see the “echo chamber effect”, so you see the same ideas, but it’s just tweaked, you’ve seen it before. There were some new ideas and some new approaches to ways to address those and construct solutions for those problems evidenced by the teams here,” said Bruce Toyama, Business Development Director for Artificial Intelligence Programs at SUNY Polytechnic Institute. Toyama said the problem-solving part of this project is useful and will translate to just about anything the students do either in school or beyond, and that having an idea of how a business is run will make them more successful whether they start their own business or work for someone else.